Dr. Prashant Pervatikar completed his MBBS from Jawaharlal Nehru Medical College, Karnataka, India in the year 1999. Later he did his PG in MS Orthopaedics from Bhairamjee Jeejeebhoi Medical College, Ahmedabad, Gujarat in 2004. He completed the European Spine Course and was awarded the European Spine Course Diploma in 2013. He also cleared IELTS, 2007 with a band of 8.5. 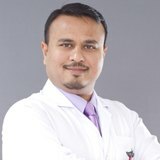 He began his career, as Junior Resident in Orthopaedics in Civil Hospital, Ahmedabad during 2001-2004 and he went on becoming the Senior Resident in Orthopaedics, in the same hospital by 2004. He worked as Assistant Professor and Specialist Orthopaedic Surgeon at SDM College of Medical Sciences and Hospital, Dharwad during 2004 – 2009 and later he worked as Associate Professor and Consultant Orthopaedic Surgeon in the same college. By 2010 he joined NMC Specialty Hospital as Specialist Orthopaedic Surgeon and HOD. He has overall 19 years of clinical experience in Orthopaedics. Dr. Prashant Pervatikar has submitted a dissertation titled, Comparative Study of Steffee and Moss-Miami Pedicular Screw Systems in the Treatment of Thoracolumbar Burst Fractures - A Retrospective Study of 100 Cases. Adding up to his credit he has done further training, to name a few. He is a professional member of ASIS (Association of Spine Surgeons of India), KOA (Karnataka Orthopaedic Association), IOA (Indian Orthopaedic Association) and HDOA (Hubli Dharwad Orthopaedic Association). He speaks English, Kannada, Hindi, Arabic and Urdu.